Powering mobile accessories is tricky business, with companies forced to balance concerns of capacity, charging speed, and ease of use. That challenge is doubly hard for something like a stylus, where space is at an absolute premium. Samsung’s S Pen has long offered a graceful solution to these issues, leveraging Wacom digitizer technology to power the stylus by way of an electromagnetic field, without requiring any power supply on the S Pen itself. But now with the new Galaxy Note9, Samsung is giving its stylus Bluetooth connectivity, seriously complicating this arrangement. Luckily, Samsung has come up with another elegant solution, though one with some important limitations. The new S Pen looks and feels a whole lot like past models. It’s got the same pressure-sensitive tip, as well as a clicky side button. But while past styluses would only operate when in direct proximity to the phone’s screen and its power-giving EM field, the Note9’s is a Bluetooth LE device that also lets you use that side button as a remote, starting apps, snapping pictures, and performing a number of other configurable actions — all while working at a distance from the Note itself. Samsung’s even releasing an SDK in September to give third-party devs the opportunity to enhance their apps with S Pen remote shortcuts. But while that extra functionality sounds nice, Samsung has put itself in a bit of a tough spot by bringing Bluetooth to the petite S Pen, forcing it to figure out a new way to power the stylus when operating away from the phone. And rather than going the traditional, obvious route of breaking down and giving the S Pen a battery, Samsung instead chose a much more unusual solution: powering the S Pen with a supercapacitor. 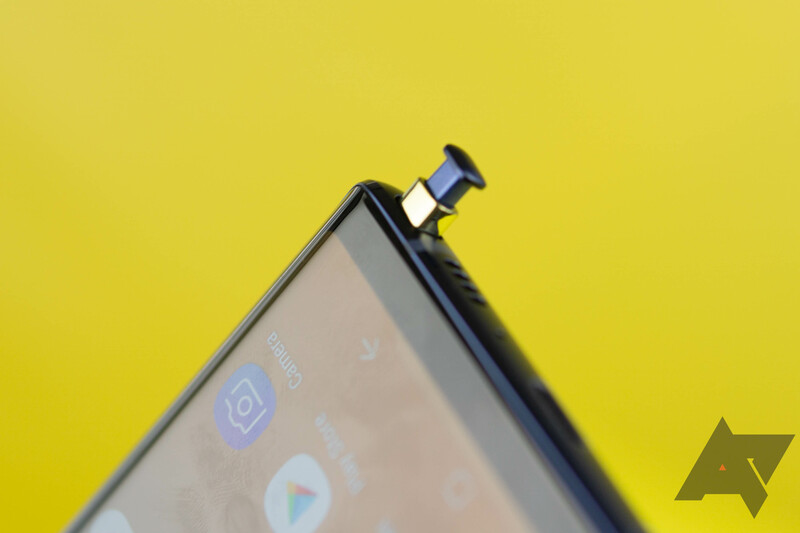 Plenty of tiny mobile accessories find success getting their power from eensy-weensy batteries — untethered wireless earbuds being a prime example — but their power needs are pretty far removed from what Samsung’s doing with the Note9’s S Pen. There’s no audio to stream here, nor a lot of data to send in general — just the occasional, momentary input from the S Pen’s side button. That design limitation empowers Samsung to get by with positively minimal power requirements. Supercapacitors, and capacitors in general, can act a lot like batteries: they store a charge that can be used later. And while their power density and overall capacity is lower than batteries, they have the distinct advantage of recharging very quickly. These characteristics directly lead to some of the benefits and limitations of Samsung’s system. While docked within the Note9, the S Pen recharges by way of an inductive coil — just the way the phone itself can charge on a wireless pad. So every time you pop it out, its supercapacitor is fully-charged and ready to use. But this is also when your clock starts ticking, and between keeping up the Bluetooth LE connection and losses from the self-discharge inherent to capacitors, you only have about 30 minutes of standby time before the S Pen needs to be reinserted into the phone to charge back up. Actively using the S Pen’s remote features run down that charge even faster, and users can expect a maximum of a couple hundred button presses. This is so low that you can tap away on the button and watch the reported charge drop to 90%, 80%, all the way to zero in the span of just a couple minutes. Thankfully, the phone issues a warning notification at 20% to let you know it’s time to recharge. The good news there? 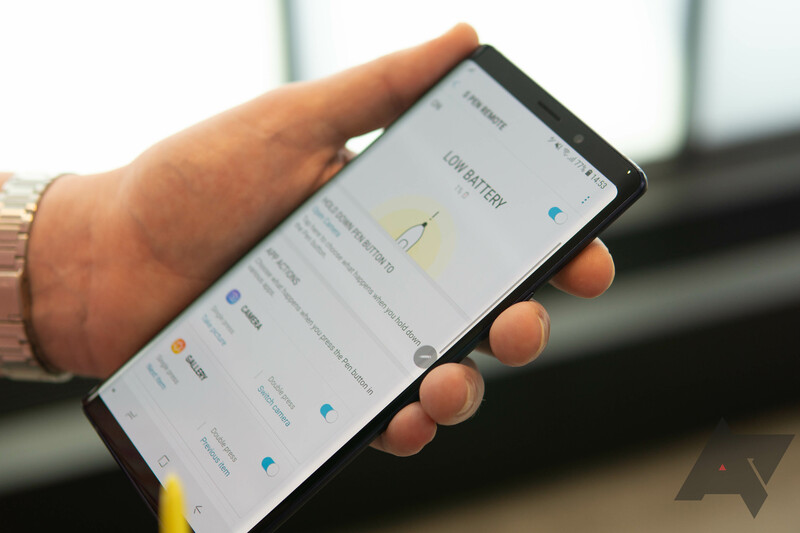 Recharging hardly takes any time at all, and a fully-depleted S Pen will be back to 100% charge after under a minute in the Note9 — 40 seconds, actually. Well then what’s the problem? Samsung’s solution makes the best out of an awkward situation, but it has its limits. The company’s really pushing the Note9’s DeX support, and combined with the S Pen remote to control page transitions, that makes for what looks like a convenient way to share presentations right from your phone. But if your presentation lasts more than half an hour, or involves a healthy number of pages, you could be in trouble. I also would have loved to seen the Note9 S Pen capable of trickle charging by grabbing some of the EM-field juice that powers the regular stylus action — that wouldn’t be a ton of power, obviously, but maybe enough to stretch the normal half-hour standby time out to a slightly more useful length. Even with these caveats at play, what Samsung’s come up with represents an innovative, workable solution to an uncomfortable problem. Maybe the most frustrating part is how little of these advancements will carry over to other mobile accessories. Don’t expect to see supercapacitors powering Bluetooth earbuds any time soon, no matter how much we might wish that 40-second recharge times could become the industry standard. But for very, very low-power use cases like Samsung’s here — well, it’s a cool, unusual way to make possible something that might otherwise have been a massive headache.